Tokyo Ghoul is a dark fantasy manga series that came out in 2011 and was adapted into an anime series in 2014. It is a world where ghouls exist and live amongst humans. Ghouls are monsters that need to consume human flesh to survive. They look like ordinary humans but possess several superhuman abilities, including regeneration, enhanced strength, and resistance to some weapons. Ghouls also possess a predatory weapon called the kagune, which they can transform into a weapon to help them fight. They live in hiding to avoid the authorities hunting them down. The series follows the story of Ken Kaneki, a college student who was transformed into a half-ghoul to live after he was critically wounded from a ghoul attack. Though Kaneki is the main character and the most popular one of the series, he is not the only character there. Tokyo Ghoul has introduced many cool characters that have captured audiences due to their appearance, personality, and abilities. Some of the popular characters include Touka Kirishima, Uta, and more. 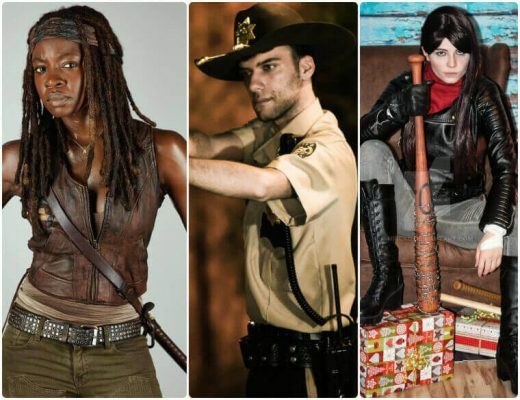 These characters are a popular choice for people to dress up in for costume parties or comic cons. This article will be a Tokyo Ghoul cosplay guide. Let's go through the detail costume DIY guide for each character. Ken Kaneki is the main character of the Tokyo Ghoul series and is, undoubtedly, its most famous character. He is the number one choice of people when it comes to dressing up as Tokyo Ghoul characters. For this Kaneki cosplay set, you’ll be getting two versions of battle outfits. The first version is a full black bodysuit with black shorts on top of it and a black short sleeve jacket-like outfit. The other version is the female version of Kaneki’s second outfit, which is a long sleeve jacket-like top. But instead of black shorts, it is paired with a black skirt. The set also comes with his Tokyo Ghoul mask, which covers the right eye and has a lipless mouth with large gnashing teeth. The costume consists of black shoes and a short white wig. 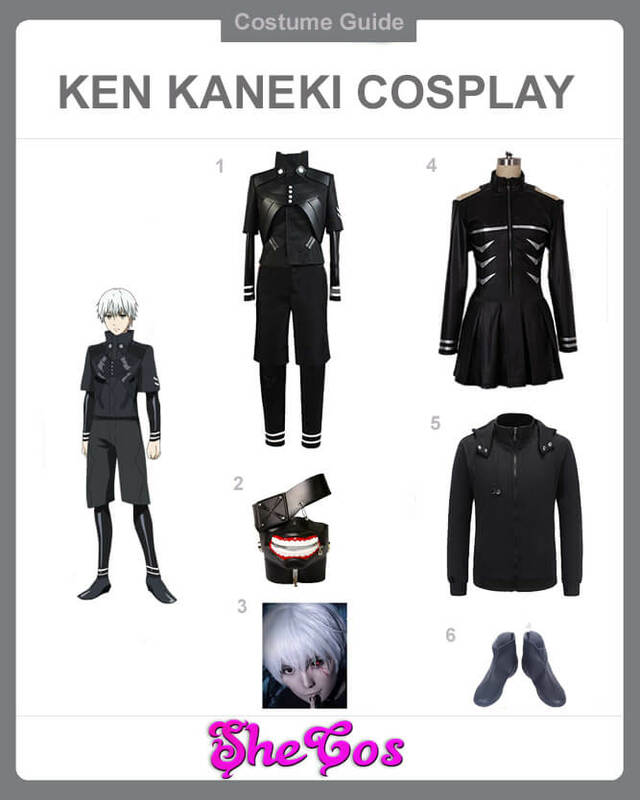 The cosplay set also comes with a Kaneki-outfit inspired black hoodie jacket. Before becoming a half-ghoul, Ken Kaneki is a relatively normal college student who lives a normal life. His life, though, changed when he went on a date with his crush who turns out to be a Ghoul that wants to eat him. After he became a half-ghoul, his quiet and regular life turned into an experience with adventure, danger, sadness, and violence. His daily struggle in trying to control his ghoul side while using its powers to protect those he cares about endeared him to a lot of people. Couple this with his neat appearance, and you can see why Kaneki is usually the first choice when it comes to cosplaying Tokyo Ghoul characters. And if you look at the Kaneki cosplay photos, you can see how cool it is to dress up in Ken Kaneki, with his white hair and awesome mask. Touka Kirishima is one of the main supporting characters in the Tokyo Ghoul series. Touka has been known to wear a variety of outfits throughout the series. For this Touka cosplay set, you will get several of the typical outfits that Touka has worn. The first one is her blue casual outfit, which consists of a long sleeve blue jacket with white zippers. It has a white polo underneath and black shorts. The other gear is her high school uniform, which comes with a grey coat with the school logo, a white polo underneath, dark blue skirt, and red bow tie. The third suit is Touka’s battle outfit, which is a black long coat hoodie jacket with black leg-length boots attached. The last one is her tomboyish streetwear, which is a green jacket with a purple top underneath and black shorts. The Touka cosplay set also comes with a short purple wig and black boots. Touka Kirishima is the main female character of Tokyo Ghoul and is the second most popular character of the series. She is a Ghoul and an ex-waitress at the Anteiku coffee shop. She is currently the wife of the main character Ken Kaneki. Unlike her husband, Touka has been a Ghoul since birth. It meant she lived a hard life of trying to survive in the world, while having to live as a human and, secretly, as a Ghoul. That also why she has a lot of distinct outfits throughout the series because she is balancing her life as a Ghoul living amongst the humans. 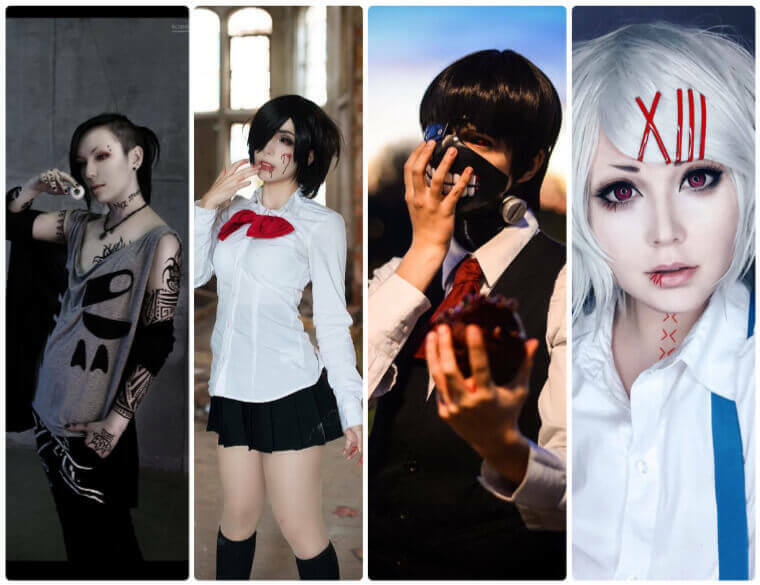 Being the main female character in the series, she is the first choice of ladies when it comes to cosplaying Tokyo Ghoul characters. 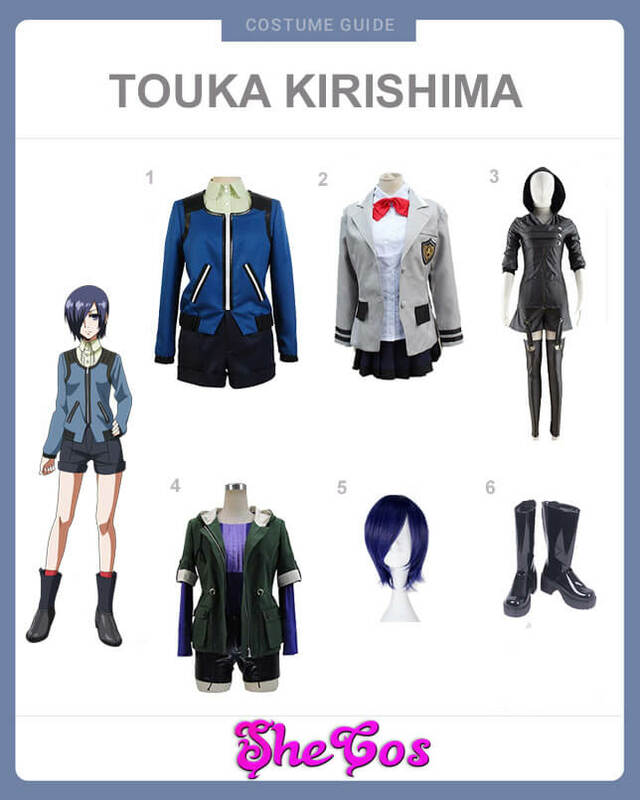 Looking at the Touka Kirishima cosplay photos, you can see that all outfits of this character look good. It will just depend on your preference on whether you want to dress up as casual Touka or as battle-ready Touka. Uta is one of the favorite characters of the Tokyo Ghoul series. He is the character that owns the HySy ArtMask Studio, where masks that Ghouls use are created and sold. He is also one of the most well-recognized characters because of his distinct appearance due to the presence of tattoos in his arms and his eyes continually appearing like his kakugan is active. Uta is one of the most natural characters to dress up in because she only wore one distinct outfit throughout the Tokyo Ghoul series. 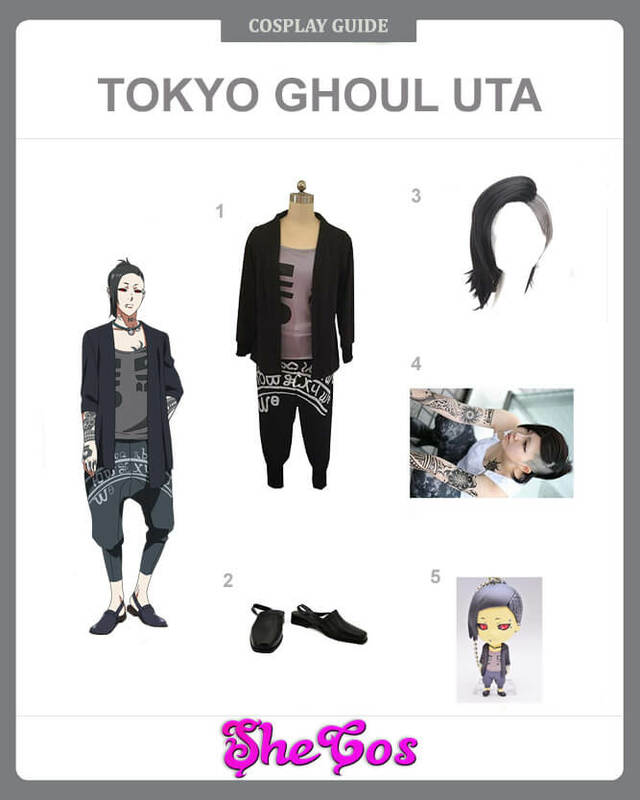 For this Uta cosplay set, you will get her full costume. It includes a grey tank top with designs and a black wrap sweater. The cosplay also comes with black harem pants and black sandals. The set comes with the arm and neck tattoos, a black wig in Uta’s hairstyle and a keychain. Uta is a Ghoul who has a scary appearance. That is because his kakugan seems to be always activated due to his red eyes and dark eyelids. The character, though, explained that his eyes are like that because of scleral tattoos. It means that black ink was injected into his eyes, thus giving this kind of look. Despite having a scary appearance, Uta’s personality is gentle and sweet. Uta is the artist who creates the mask for Ghouls. He establishes the mask based on the Ghoul’s appearance, customizing it to fit how they look. Since he is portrayed as an artist in the series, his appearance resembles that of the stereotypical artist look. Looking at the Uta cosplay photos, you can see that her appearance resembles that of a typical artist. But you can also see that he is someone you don’t want to miss. Juuzou Suzuya is the craziest character in Tokyo Ghoul. He is a Special Class Ghoul Investigator and is one of the best investigators. He has an unusual hobby of self-stitching himself, which he says is a form of body modification. Juuzou is a crazy character, but an amusing one at that, making him another choice for people to cosplay. 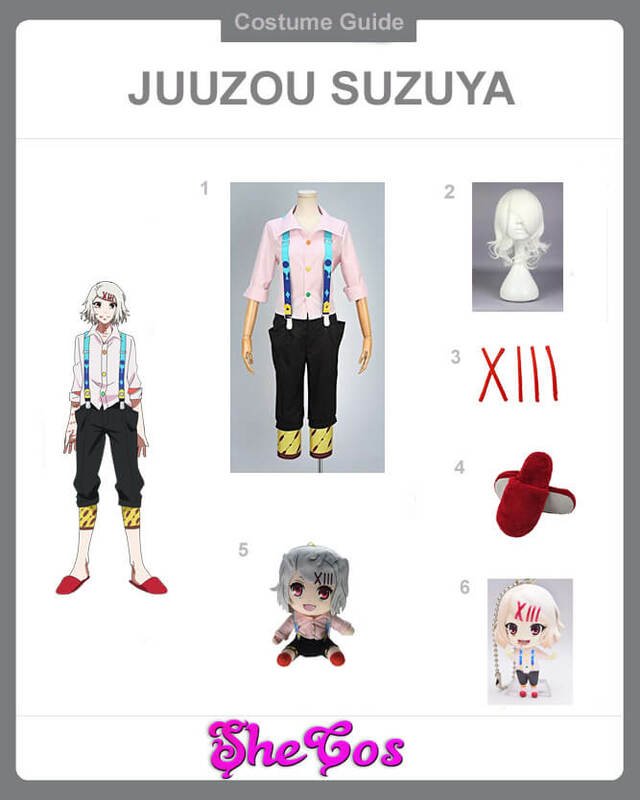 For this Juuzou Suzuya cosplay set, you will get the full costume. It would include his whole outfit, which consists of white long sleeves polo with the sleeves rolled up, and oversized black pants with yellow and red design at the end of the pants. The blue suspenders supports oversized pants. A short white wig representing Juuzou’s hairstyle, five red hairpins, and red slippers complete the costume. The set also comes with a Juuzou Suzuya keychain and stuffed plush. As a Ghoul Investigator, Juuzou Suzuya is a natural enemy to the main character Ken Kaneki and his friends. Despite being the main character’s enemy, Juuzou is one of the favorite characters in the series due to his crazy personality and amusing antics. He is also one of the skilled fighters in the series and is an expert in using knives. He was an average child at first, but it all changed because of how Big Madame treated him and prepared him to become a Ghoul Investigator. As one of the fan favorites, he is another option for both men and women when it comes to dressing up as Tokyo Ghoul characters. Looking at the Juuzou Suzuya cosplay photos, you can see that his crazy appearance is indeed an appealing and cool look to have. The character’s appearance has this sort of charisma that draws people.